Note: Folks scrambling for last minute wine-related gifts, send me an email at wawinereport@gmail.com if you need some assistance. December's Virtual Tasting is tonight! The wine is the Brian Carter Cellars 2007 Abracadabra. This wine retails for $20 and is widely available. For those of you in the Seattle area, Brian Carter is offering 15% off a purchase of a bottle of this wine at the winery through the 22nd. Also, as mentioned earlier, I have seen the 2006 vintage on the shelves in some spots, so I will be trying this wine as well. Feel free to pick it up if you see it. As usual, I will be opening the wine about 7pm and will be updating this post with comments along the way. I will also be tweeting @wawinereport and using the hashtag #virtualtasting. Please join us in trying this wine and posting your comments/tweets either tonight or in the future. 7:00pm Update: And we're off! First, let's start with some background on the winery. Brian Carter Cellars is located in Woodinville, Washington. 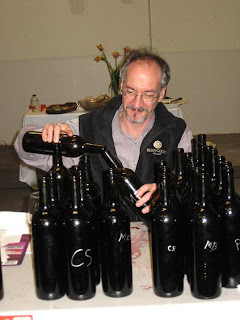 Winemaker Brian Carter brings almost three decades of experience in the Washington wine industry and has made wines at Paul Thomas Winery (now defunct), Washington Hills, and Apex Cellars. Carter began making his own wines in 1997 with his first vintage of the Solesce. This wine, a Bordeaux-style blend, is now Brian Carter Cellar's flagship wine. Unlike most Washington wineries, Carter focuses exclusively on producing proprietary blended wines. These include two Bordeaux-style blends, a Super-Tuscan-style blend, and a Southern Rhone-style blend. The Abracadabra is Carter's table wine. This wine was first introduced in the 2005 vintage. 7:30 Update: As I mentioned earlier, I am sampling both the 2006 and 2007 wines as I saw both on the shelves. I'll start with the 2006. Popped and poured. Composite cork. Wine is at 66 degrees. Let's see if we can dissect the components of this wine a bit. Pretty, smoky Syrah notes along with appealing Grenache red fruit on an enjoyable nose. Earth and slate aromas often seen in Washington Sangiovese. Also a nice component along with black licorice. I get a bit of alcohol on the nose. Taste is tart and front loaded with a lot of cherry fruit. A lot of different things going on that I'm having a tough time teasing out right now. My immediate impression is that I like the nose but the palate doesn't seem to entirely come together. Time to give the 2007 a try. 8:00 Update: Sticking with the 2006 for the moment, what I am finding most interesting about this wine is trying to dissect out the different components of the wine on the nose and taste. I'll scare up some information on the blend later but you can definitely pick up Syrah, Grenache, Sangiovese, and Cabernet. I find it a bit easier to pick them up on the nose than the taste right now. Moving on to the 2007, this is an entirely different wine altogether. No surprise as Carter varies the composition of this wine each year. Lots of Cabernet on this beast. A pretty nose with cherry along with milk chocoate, light herbal notes, and black licorice. Harder right now to tease out the components of this wine on the nose outside of the Cabernet. The taste is, as with the 2006, quite thick and rich. This wine has a bit more immediate appeal than the 2006 with a more complete palate. Wait...what's that? Some Petit Verdot? Some Cabernet Franc? 8:30 Update: As I mentioned before, Brian Carter is reknowned for his blending skills. The 2006 wine is predominantly Syrah. The winery states that "the following went into the cauldron"
Kudos to the winery for providing the vineyard information which I am always interested in seeing. The 2006 wine is 13.8% alcohol. 1,313 cases were produced. The wine comes in at a somewhat surprising 13% alcohol, considerably lower that most in the state which are routinely between 14.5 and 15%. 1,599 cases were produced. The 2007 vintage retails for $20. I received this wine as a sample from the winery. The 2006 wine retails for $18. I purchased this for $15 at Pete's Bellevue. Next up, what the major publications had to say about these wines. 9:00 Update: Here what the major publications and others have to say. In CellarTracker, a total of 3 notes on the 2006 which averaged 85.5 points. 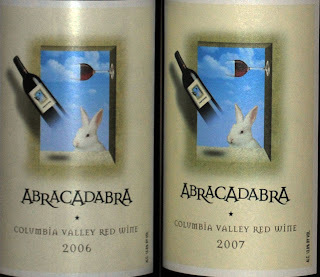 The red offering, the 2007 Abracadabra is a blend of 8 red grapes with Cabernet Sauvignon and Petit Verdot making up just over half of the blend. Dark ruby-colored, it displays an aromatic array of cigar box, cinnamon, violets, black cherry, and black currant. Medium to full-bodied, it has ample layered, savory fruit, a bit of structure, some complexity, and excellent length. It will offer pleasure over the next 3-4 years. Only 1 note in CellarTracker for the 2007 which did not include a numerical rating but noted that the wine was initially a bit closed. Some final thoughts on these wines. Both are, indeed, a cauldron of varietals. The 2006 brings a lot of interesting things on the nose including smoke, red fruit, and earth. The palate doesn't quite stand up by itself but would be fleshed out by some food. I like this wine a bit more for the intellectual exercise of teasing out the different varietals than straight-forward drinking enjoyment. I would give this wine somewhere between a . and + in my rating system. The 2007 brings more, especially on the palate which is pretty full-bodied, strongly dominated by the Bordeaux varietals. I would give this wine a + in my system. Thanks to everyone who took part in this month's tasting. We'll do it all again next month. If you have a suggestion for the wine, pop me an email. nose - earthy, dirt, maybe some mushrooms. Fruit is red, maybe cherry. Also has very slight hints of licorice aromas. Nice, fun and interesting. palate - initial palate is big, rich, hits the peak about 1/3 of the way through. Nice even finish. LI, I agree that it is an interesting, fun nose. Palate definitely peaks a bit early, although it is quite rich. Thanks for the comment. Light nose, but it was just opened so I think it will get bigger. Still, very pretty. Light herbs, chocolate. Palate is long and lovely. Earth, tobacco and even along the tongue. Anon, definitely a lot of earthy components on the 2007. Potting soil flavors. Thanks for the comment. I was soooo disapointed we missed them when we were in Woodinville. Only so much tasting to do in 2 days. Thanks for sharing your notes! drinknectar, you should definitely stop by the next time you are in Woodinville. So many wineries. So little time! Thanks for the comment. 2006 after a bit of time...the syrah stuff becomes more predominant. Still a bunch of earthy stuff that is true to his style. DrinkNectar - not only is this a great winery, but also such nice people there. Defintiely it is a not-to-miss. Their bordeaux style of blending is much different than most WA wines. LI, agreed that the Syrah gains some steam. Also second that these are some very nice folks at the winery. And they have some BIG plans which they have a model up of there.